Hi! Today I learned about the Create Table statement, it allows you to create and define tables, as what I studied on the last episode, it is a DDL statement (Data Definition Language). 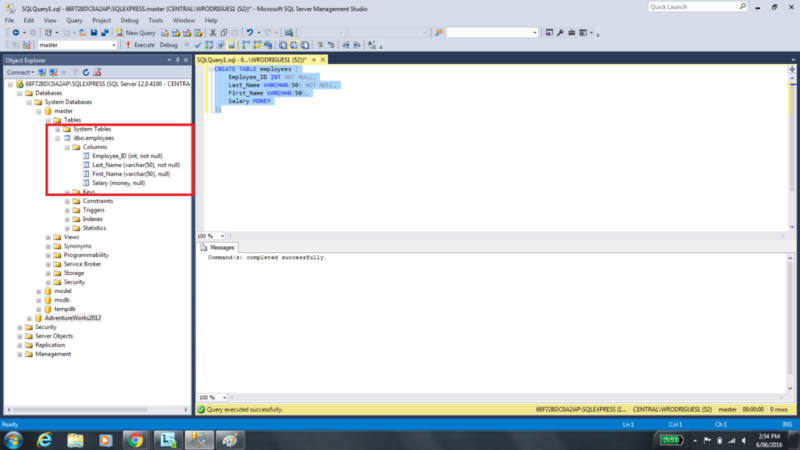 Let’s look at an example of how to use the CREATE TABLE statement in the TSQL. This example creates a table called employees which have 4 columns. The first column is called Employee_ID which is created as an INT datatype and can not contain NULL values. The second column is called Last_Name which is a VARCHAR datatype (the number “50” inside the parentheses means that the maximum characters in length are 50) and also can not contain NULL values. The fourth column is called salary which is a MONEY datatype which can have NULL values. The detail that this statement has is that it isn’t defined a primary key for the table in TSQL. The primary key is a single field or combination of fields that uniquely defines a record. Something that I guess you could realize is that I mentioned many times about datatypes, this is the next subject that I’m going to learn but I’ll create a new article about it, to make it easier.